I show off my build in this video. I'll be adding a timestamp in comments which shows when I later change the build slightly. Anyhow, feel free to comment/like. For example your second and third combo hit high for along time and you dont have a fast, low or vertical alternative. That means if you have an opponent that memorizes your deck at least a bit, he'll be able to counter those extremly fast and well. Im not saying you should change your deck by any means but i'd like to give you a bit of advice for building stronger pvp decks. So all in all: you already did "3" quite well and 2 good half way through but what your deck and that one i made out of it really lacks is step 1. the kinetic chain is weak and will be destroyed by fast elbows ,jumped light kicks or back tripped kicks. Therefore i would highly recommend you to get a guard break engage and better knockbacks into your deck. Although a fast engage like "fast elbow" ,"gut punch"(because of its range), "back turn wrist", "jab punch" or "jumped light kick" to counter other guard breaks or slow attacks, could help your deck alot. Hey Metha, I appreciate it. I thought about what you said, and did some tinkering around. The main thing I changed in the end was that my first primary attack & its matching alternate do a different type of avoid. I've noticed that now I'm having much less trouble getting "stuck" in a stance without an opening to attack. Actually Methos, I ended up changing my Top right Alternate to body blow, and my bottom right to Tetsuzankio. Now all my alternates are a side step, and they all go ( i think ) clockwise now.. I've noticed difference in that I can now depend on having a reasonable way to side step a sudden Guard break. I need to take your advice a bit more in depth though, and look into which stance each move leads, checking to see which alternate move will be available. Body blow is a pretty strong start up and as long as sloclap doesnt fix the sidedodge bug , body blow even counters charged attack. Maybe try out some hard hitting moves that are 12start up or faster so you can cast them after an absorb. In general its good to have at least two fast start ups in each deck. You already have back tripped kick wich is really reliable but hits low thats why i would additionally recommend the"hook" for you. i just skiped to where you fought someone and watched the first round. Buddy im going to drop some tough love on you. I dont know what style you are... thats a problem you didnt use your style ability once. you relied on the moves over your own skill, you just hoped the moves would dodge what ever hed throw at you. basically what im trying to say is win or lose id find it boring to fight this deck and i woulndt feel like im actually fighting you. 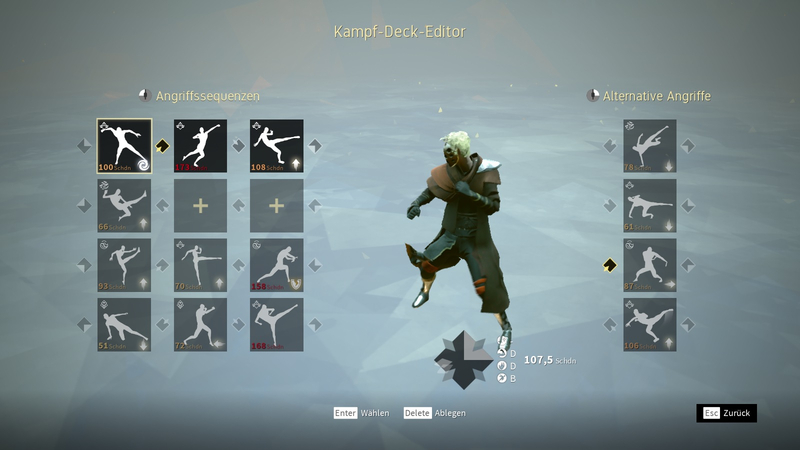 Practice looking at your opponent and studying them and using your style ability( i know lag can make this hard sometimes) but it will favor and stimulate growth in your absolver skills making you able to use moves that are harder to land but way more fun to use. P.s what methamos calls kinetic chain (hitstun) is also very important look at what advantage on hit and advantage on guard moves have a place them in consequence. Thanks for the feedback. I often do realize that I'm not making use of my Khalt ability, usually after awhile of blocking or failing to counter with an attack. The failure to block is my main downfall lol. My best flow/rhythm fights I do make use of it, as sometimes I feel like I'm in "the mode". I designed the build, though, to counter primarily with avoid attacks, so though I'm not using Khalt, I am analyzing the opponents moves and I'm looking for when I should either avoid horizontally or vertically, as primary attacks avoid vertical and my alts go horizontally. To use your deck to counter enemie moves is essential too ofc. I feel mastery over key tools is worth more then having alot of them. 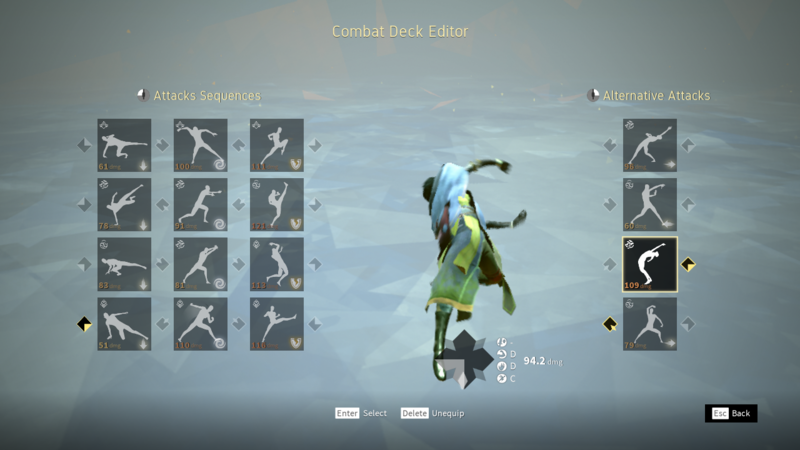 Here's my updated combat deck, which I feel is getting close to final form. I'm gonna try to cast a net for PC users on YouTube, playing this deck with keyboard and mouse. Specifically, I'll post a video showing how I can quickly change my stances with the keyboard shortcuts, to get to the moves I need access to. Also, how targeting / disengaging / running is theoretically easier to do using traditional PC controls. I'm learning how to feign into these deeper chain moves, and it is pretty effective. The defensive ability is unalterably bound to mouse directional movement, which I think is very difficult to master, so I'm trying to skirt that problem by using the dodge ability & these avoid abilities. I have noticed that a deck like this nets a good deal of shards, because each successful avoid gives you essence. As a side note, this barehands deck I used as a model for my sword deck, and it is legit. I can't STAND your combat-deck, ocybin. The openers are all lows, so you can most likely cheese an easy hit against your opponents. Personally, I like to make a more fun and interesting deck that can still be utilized. Well you're mostly right I think AracKid - I was using all those avoids because when I was playing before I could never get used to using the right joystick for the special abilities, and I was trying to make a deck to compensate for my lack of skill with the special abilities. It sort of worked, but skilled players still pretty much owned me, because they could control their character well enough to exploit my deck, but it was still fun - but pretty much the only way I could get a win was in a deck with heavy avoids. For a long time I was asking SloClap for keyboard bindings, (my username used to be Ocybin), and when they finally updated it I found it to be super hard to control with KB&M, haha - I now regret asking them for something that is in such a limited demand, but they did it. Big Thanks to the devs. Now that those specials can be bound, I mapped them to keybinds and bound them to my steam controller.